Demonstrates how to setup and configure the QuoteWerks Peachtree Accounting Integration. What versions of Sage 50 - US Edition / Peachtree does the link work with? versions: 2018, 2017, 2016, 2015, 2014, 2013, 2012, 2011, 2010, 2009, 2008, 2007, 2006. What if I have an older version of Peachtree? versions: 2016, 2015, 2014, 2013, 2012, 2011, 2010, 2009 (16.0), 2008 (15.0), 2007 (14.0), 2006 (13.0). What if I have an older version of Peachtree/Sage 50 US Edition? Did you know? QuoteWerks is the only Sage 50 Gold Development Partner in the Quoting and Proposal space! What does the QuoteWerks to Peachtree link do? • Exports your QuoteWerks Quotes/Orders/Invoices to Peachtree as Peachtree Invoices/Sales Orders one at a time or in batches. • Exports Purchase Orders to Peachtree enabling you to include items from different Orders on a single Peachtree Purchase Order. Optionally, QuoteWerks will create a separate purchase order for each vendor referenced in a single QuoteWerks document that you are exporting to Peachtree. • If the customer in the QuoteWerks document does not exist in Sage 50 - US Edition (Peachtree), it will be automatically created. If the customer already exists in Sage 50 - US Edition (Peachtree), the customer information can be optionally updated automatically. • If items/parts in the QuoteWerks document do not exist in Sage 50 - US Edition (Peachtree), you will be prompted to select the type of item it is (Stock item, Non-stock item, Service, or Labor), and you will be prompted to select the income/expense account to be associated with this new item. • QuoteWerks can search Sage 50 - US Edition (Peachtree) for contacts to be used on Quotes. • QuoteWerks can link to and search the Sage 50 - US Edition (Peachtree) item list, so you can add Sage 50 - US Edition (Peachtree), items to your quote. • Documents exported to Sage 50 - US Edition (Peachtree) are marked as exported so you will know which documents have been exported, and which have not. I already use Sage 50 - US Edition (Peachtree), how will QuoteWerks complement Sage 50? While there is cross-over in the functionality of QuoteWerks and Sage 50 - US Edition (Peachtree), they are considered complementary products, not competing products. QuoteWerks software is the link between contact managers and accounting software. It was designed to allow each of the respective software product do what they do best. Accounting software supports receivables, payables, purchasing, inventory management, asset management and payroll. Contact management software allows you to manage your customers, leads, and marketing just to name a few. QuoteWerks on the other hand employs both. It enables you to utilize information stored about a customer in your CRM package to generate a sales quote that can be exported to your accounting software for purchasing, invoicing, and receivables. Quoting software is used by companies that do not want to flood their accounting software with part numbers and quotes that may never be used or become orders. Another reason for using quoting software is for larger offices that have many sales people, and do not want all of the sales people using the accounting software for two reasons. First accounting software licenses are generally more expensive than quoting software licenses, and secondly, there are security issues relating to lot's of sales reps having access to your accounting software. Quoting software is also more flexible in terms of tweaking profit margin, more pricing models, links to other software such as contact managers etc. Quoting software has a specific niche of it's own that fills in the quoting gaps left behind by CRM and accounting software. There are many reasons why not to use your accounting software for creating price quotes. • QuoteWerks links with leading CRM solutions like ACT!, Autotask, ConnectWise, GoldMine, SalesLogix, salesforce.com, Maximizer, MS Dynamics CRM, and Outlook. With these links you can easily pull your prospect name and contact information into the quote and when the quote becomes an order QuoteWerks will create that new customer in Sage 50 - US Edition (Peachtree) eliminating any re-typing of data. Also, the links write data back to the contact manager such as a follow up call and sales opportunity forecasting. Sage 50 does not write back to the contact manager, nor does it offer the level of integration that QuoteWerks does. In Sage 50 - US Edition (Peachtree) before you can quote an item to a customer you have to create that item in Sage 50. Creating the item in Sage 50 requires that you specify a part number, description, income account, cost, price, etc. Then if the quote/estimate does not become and order, this item stays in Peachtree cluttering your item list. In QuoteWerks, you do not have to create an item before you quote it. Additionally, when the quote becomes an order, QuoteWerks will create the item in Peachtree for you using the description, part numbers, costs, and prices used in the order. Include pictures of products in the quote. Include spec sheets for products in the quote. With QuoteWerks a virtually unlimited number of users can be using QuoteWerks across the network at the same time. Peachtree supports a maximum of only 5-users (Peachtree Accounting), or 30-users (Peachtree Quantum) running Sage 50 - US Edition (Peachtree) at the same time and in many cases only enables one user to access an area of Peachtree at the same time. QuoteWerks supports 9 different pricing methods including Markup, Discount, Gross Margin, Volume based, List, Formula, Fixed, Customer Price Levels, and Customer/Product price matrix. Peachtree allows for only a few pricing methods. QuoteWerks has the ability to specify required items. For instance, when you add Part A, QuoteWerks will also add Part B, Part C, and Part D because they are a requirement of Part A. Peachtree does not offer this functionality. You can also specify substitute and optional items. QuoteWerks offers a visual Configurator that will allow you to systematically build your product and add it to a document. • QuoteWerks enables remote sales reps to create quotes and synchronize them back to the main office where they can be imported into the primary database. Peachtree has no support for remote users or offices creating quotes/estimates. QuoteWerks offers a complete security package for quoting needs. You can limit which menus are available, the ability to modify products, layouts, reports, etc., and access to other users documents. Peachtree security features are very basic in the sense you can either provide access or not. You do not have many options. • QuoteWerks has links to the pricing databases of PC Industry distributors D&H, Ingram Micro, SYNNEX, and Tech Data. Additionally, QuoteWerks can get Real-Time Pricing & Availability from D&H, Ingram Micro, SYNNEX and Tech Data® extending the reach of how far a bridge QuoteWerks can create between the outside world and Peachtree itself. Run reports on commissions and display the commission for each quote/order on the quote. QuoteWerks has the ability to compare item prices between vendors and show the best price.. The tool will also allow you to specify which vendor(s) to search on. Peachtree does not offer this tool. QuoteWerks can easily hide the prices of certain items in a document. You can specify what an items print properties are through an item attribute menu. Peachtree does not offer this functionality. QuoteWerks provides many document automation features. It enables you to very easily select and combine cover sheets, spec sheets, and literature documents that support the quote for simple delivery of the quote by print or by e-mail. Peachtree does not support these features. QuoteWerks enables you to easily view a part/item price history as well as a customer's part/item price history when adding the item to the quote. QuoteWerks enables you to organize and view your products in multi-level folder trees. Peachtree only displays the product list in a straight list format. QuoteWerks can easily calculate your profit margin per quote, order, and invoice, and is readily available. Peachtree does not show profit margin very easily. Normally you would need to run a report to get this information. What does the Peachtree link cost? The QuoteWerks integration with Peachtree is Free with the Professional and Corporate Editions of QuoteWerks. The Standard Edition does not include the Peachtree link. Can I get a demo version of the Peachtree link? Yes. The Peachtree link can be evaluated using the demo version of QuoteWerks. You can use the Peachtree link by selecting the Tools|Export to Peachtree menu in QuoteWerks. You can download the demo version of QuoteWerks by clicking here. How to setup and use the Peachtree link is documented in the QuoteWerks user manual accessed by selecting the QuoteWerks Help|View Manual menu. If I purchase a multiple-user license of QuoteWerks, do I need to buy multiple copies of the Peachtree link? No. You only need to have the Professional or Corporate Edition of QuoteWerks no matter how many users you have at that site. What should I know about the link? 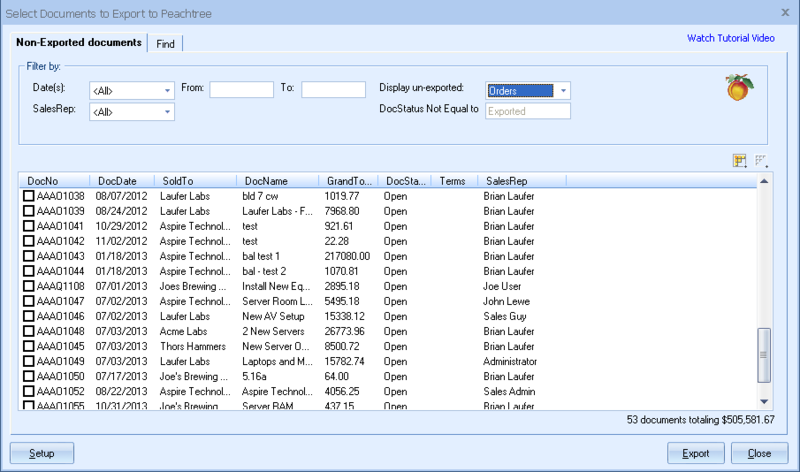 QuoteWerks can create invoices and purchase orders without Peachtree. The Peachtree link was designed for companies that would like to quote in QuoteWerks, but still create their invoices and Purchase Orders in Peachtree. Using the Peachtree link you will save a great deal of time because you will not have to manually enter invoices in Peachtree. QuoteWerks integrates with Peachtree using two methods: Interactive and import/export. It is important to note however that you will need to spend some time reading the manual, and setting up the link correctly. On average, it will take you around 30 minutes to setup the link. • Vendors used for the purchase orders must already exist in Peachtree. • The vendor Address on purchase orders is pulled from Peachtree, not the QuoteWerks document. • Peachtree has an item description limit of 160 characters on invoices/sales orders and purchase orders. • Peachtree item descriptions cannot contain distinct lines, rather the entire description is automatically wrapped to the next line as required. • If you work with multiple Peachtree companies, you must open the Peachtree company that you want to import into before you run the Export to Peachtree process in QuoteWerks. • QuoteWerks Group Header line items are not exported. The Group Member line items within the group are exported. • The use of a Price Modifier in the Price Modifier column of a QuoteWerks group header line item is not supported. • Peachtree does not support compound taxes (sales tax computed on top of sales tax). • When importing invoices, Peachtree does NOT automatically number the invoice. Peachtree generally assigns invoice numbers when you print the invoice. To manually add the invoice number, choose Tasks, Sales/Invoice, click the Edit button, then select the desired invoice. Enter the invoice number, then click Post.